... do as the Romans do. When in the UK, eat a kebab. Well, other things too. But definitely a kebab. This is not the relatively healthy ancestor sold in Middle-Eastern bazaars; nor is it the German variant with a strong Turkish pedigree; this is authentically and wholeheartedly and chin-wipingly British. Even the umlaut from the original döner has been dropped - a sure sign of anglicisation. I support the kebab shop with queue of people, hoping that it's less dodgy than the empty one next door. Take a bun, pretend it is pita, grill it briefly. Then use something that looks like an electric sheep shears to shave chunks off a slowly roasting pillar of anonymous meat, letting it drop into the open bun. Chilli sauce? It is red, the colour of All Gold. Then rough slices of onion, cucumber chunks, shredded lettuce and two token slivers of tomato. More of the red stuff. And sommer garlic mayonnaise too. 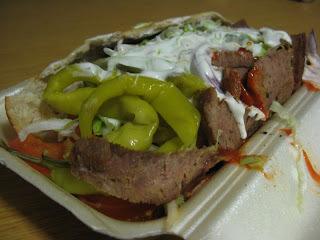 Add a few thin pale-yellow pickled chillies, and you have your doner. I somehow doubt that aesthetic appeal is on the list of priorities. The result? Something your mother would never buy*. A styrofoam box that tickles you tongue with chili as soon as you open it. Garlic and onion follow shortly after. The flavours are strong, with an RDA's worth of calories, fat and salt. Don't look too closely at the meat, you might realise it really is just a sponge. And eat it before it cools down. It's messy, greasy, very filling and strangely satisfying. Will it give you heart disease? Definitely. Will it make you obese? Probably. Does it encourage the exploitation of migrant workers? Yes. Does it contribute to climate change? Yes. Will I buy it again? Yes. I just need a couple of months for the arteries to clear. One day, I'll make it at home: lean grilled meat, fresh bread, onions, lettuce, cucumber, strong chili, lemon and some yogurt perhaps. Coriander would also fit somewhere in the chaos of flavours.